When Israeli Prime Minister Benjamin Netanyahu paid an official visit to China this May, he brought along not just a group of senior Israeli officials but a delegation of Israeli business executives eager to expand ties between their country and the world's most populous nation. The two countries hope to boost Israel's annual trade with China from a bilateral volume of US$8 billion in 2012 to US$10 billion over the next half-decade; deepen cooperation in high technology sectors; jointly construct industrial parks and technology transfer centers, and boost agricultural cooperation. Why does China, an industrial powerhouse with a population of 1.35 billion, care about tiny Israel, with its population of only eight million? What are the economic and strategic foundations of this bilateral relationship, and why is it so significant for Israel as well? What strategies are the Israeli government and private sector using to expand their presence — and their country brand — in China? And what are the challenges for achieving their goals? "Our aim is to double it within the next five years," Rozenblat says. Remarkably, two-thirds of Israel's current volume of exports to China derives from two companies: Intel Corp., which exports to China chips designed and manufactured in Israel, accounting for about one-third of the total Israeli export volume to China. The other third comes from Israel Chemicals, Ld. (ICL), which ships chemicals to China. This situation, notes Rozenblat, is "very weird." 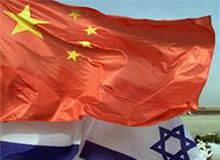 Rozenblat is optimistic that Israel's exports to China will become more balanced in the future. "Prime Minister Netanyahu's visit met our expectations and more." Moreover, "the timing is right" for such progress because Netanyahu was recently reelected and the new Chinese leadership seems ready to move forward in strengthening the relationship, Rozenblat says. In short, there are no internal political barriers in either of the two countries to solidifying mutual ties. Given its concentration into just two sectors — microchips and chemicals — which other sectors provide the greatest potential for expanding Israel's exports to China? Israel is counting on leveraging its strong overall brand as a technology provider to provide a broader range of high-tech products. Echoing comments made by Netanyahu during his visit to China, Rozenblat notes that the nation's high-tech firms "are highly sophisticated. Israel is a world center for research and development, and many U.S. companies use Israel as a center for their R&D." He says Chinese high-tech executives and officials are well aware, for example, that "Apple has only one R&D center outside the U.S., and that … center is located in Israel. We want Chinese firms to have [R&D centers] in Israel, too." The Israeli and Chinese markets are "very complementary," according to Seth Kaplan, chairman of the Israel Asia Center in Jerusalem, and managing partner of Alpha International Consulting. "What Israel is strong in, China is not, and vice versa. The great sources of technology [in Israel] — environmental [technologies], water [management], agricultural technology, security — all matter to the Chinese, and Israel is very strong in all of these areas." In particular, "China is not a sophisticated market for agricultural products," Rozenblat notes, so Israel is mounting an ambitious campaign to sell a "whole range of equipment" for boosting China's lagging agricultural productivity. For example, while the average Chinese cow produces only 3,000 liters of milk per year, the average Israeli cow produces 11,500 liters of milk; far exceeding even the average level of U.S. production in that key indicator. One kind of Israeli equipment uses GPS devices fixed on cows' collars to sense when a cow needs to be milked, and then automatically sets up the milking equipment. In recent years, groups of Chinese dairy farm manager trainees have completed multi-week courses in Israel organized by Animal, an Israeli provider of computerized systems for dairy farm and herd management. The Chinese were sent to Israel by their companies to learn about advanced animal welfare and operating procedures. Thereafter, the AfiMilk technologies were installed in dozens of milking parlors in China, helping to raise the average Chinese milk yield per cow well beyond the ordinary levels in the country, where the dairy sector does not have deep historical roots. The Israeli demonstration site in China is functioning as a training center for thousands of dairy producers in China. Adds Kaplan, "There is also a cultural dynamic" between the Chinese and Israelis that helps build personal relationships. "They are two ancient civilizations [Chinese and Jewish] that have more things in common, in working style and business style, than meets the eye." Israel's country brand as a source of innovation is already strong enough in China, that the best-selling business book "Start-Up Nation: The Story of Israel's Economic Miracle," by Dan Senor and Saul Singer was an especially huge success there, according to Kaplan. Nevertheless, Israeli firms face the challenge of expanding awareness about their products to a broader range of sectors, notes Rozenblat. How can a small country with limited manpower achieve that? One useful tool is China's emerging electronic social media networks. "The Chinese are the most active people in the world in social media," says Rozenblat, whose consulate office in Shanghai provides direct links to its own online blogs on major Chinese social media at the tail-end of each of the consulate's official e-mail messages. Although the Chinese are banned from accessing Facebook and YouTube, he notes, "many social media platforms exist [in China], and our consulate has 84,000 followers on Twitter." By mid-May 2013, close to 1.2 million page views had been recorded on the Israeli consulate's blog pages on Youku.com, the popular Chinese equivalent of YouTube. Recent videos showed Prime Minister Netanyahu speaking with the mayor of Shanghai; visiting Israeli actress Gila Almagor promoting her autobiographical memoir, and an interview with executives from Powermat, an Israeli provider of wireless technology for charging electronic devices (including the iPhone4 and iPhone 5). Other prominent Israeli social media blogs appear on Tudou, Weibo, t.qq.com and Kaixin. In part because of such promotional efforts, Rozenblat says,"Our brand in China is very good, surveys show. Economically, there are no obstacles. In China, the branding of Israel and of Jews is as a smart people, which is very good for us." According to Wharton marketing professor Qiaowei Shen, "social media marketing of certain products is effective," and that if people advertise on micro-blogs in China, "the posts and re-posts can translate into higher sales." It is not only manufacturers who are doing that, she adds, but also government offices, particularly on a local level, in an effort to head off negative rumors before they acquire so much traction that they are widely believed. When it comes to country-branding efforts, other nations, include some in Europe and the Pacific, including New Zealand, are loading messages on Chinese social media about their achievements and their most appealing locations, Shen notes. "This is a common practice; a window for people to know about the world, and it is potentially powerful." Kaplan sees two other fundamental challenges to Israeli success in China. First, "Israeli companies tend to be a little short term," often ignoring longer term investments that don't pay off soon. Beyond that, he says, "China is a maze, and it is never easy for foreign companies to get into the market." Kaplan adds that while Israel itself has a strong country brand in China, individual Israeli firms don't have their own strong corporate brands in the country. Wharton marketing professor Jerry (Yoram) Wind points out that while Israeli technology is widely recognized as "world class" in many areas where China can derive significant benefits, the protection of Israeli intellectual property is a major concern. "What guarantees will the Israelis have that the Chinese do not reverse engineer the process without providing benefits to the Israeli companies?" Wind asks. Previous efforts to sell irrigation products to China have not been a success, for example, because some products have been reverse-engineered and copied by Chinese companies, according to one China-based source who requested to remain anonymous. Wind says that while "social media is increasing its importance, I don't see how social media is going to affect the behavior of companies. Social media is only one touch point for effective penetration." What companies need is to use all touch points to develop a "win-win relationship" with Chinese companies, he adds. They also need to consider developing business partnerships with Chinese firms, in which the firms may jointly develop a product suited for the Chinese market, and then share in the profits. Israeli scientists can help customize Israeli-designed technology to the specific needs of the China market, Wind notes. Avrum Ehrlich, executive director of the Israel China Institute in Jinan, China, agrees that "a source of frustration for foreign technology and manufacturing firms [in China] is the concern to protect their intellectual property," but he suggests that "as the Chinese economy matures and develops its own specializations, the phenomenon of IT theft and copying will decrease. But in the meantime, many overseas companies are hesitant to enter the Chinese market, fearing they could lose more than they could gain." Ehrlich adds that in the past, some Chinese companies have "openly stated their intentions to develop their own technology portfolios by working with foreign companies for several years, learning their techniques and then afterward becoming independent. There are some cases where Chinese firms export technologies originally sold to them. This poses a death blow to Israeli firms whose sole value is in intellectual property." According to Ehrlich, "Left to the forces of the free market alone, without active and high-geared government guidance and financial stimulus, progress will continue slowly. In order to match and respond to Chinese government initiatives, it is anticipated that Israel — and other nations — will be encouraged and expected to provide matching stimulants, incentives, subsidies, loans, tax hikes and state sponsored support, making opportunities for Israeli industries and companies in the provinces more palpable." Nevertheless, political frictions between China and Israel might undermine the budding trade relationship between the two countries, some fear. As a permanent member of the U.N. Security Council, China has vetoed U.N. resolutions aimed at isolating Syrian president Bashar al-Assad, a strategic ally of Iran, whose president Mahmoud Ahmadinejad has called for the annihilation of Israel. For all that, China's pragmatic leaders have downplayed their differences about Middle East politics in their public statements concerning their ties with Israel. "China, as a friend of both Palestine and Israel, has all along held an objective and fair stance," said Chinese premier Li Kaifeng recently. "We would like to make efforts with all parties to actively push forward the Middle East peace process. Reflecting such optimism, Netanyahu has said that Israel appreciates China's "constructive role" in the Middle East peace process. "The fact that China remains on the sidelines, and doesn't play a hand against Israel, is the most that Israel can hope for," Kaplan adds. It would be unrealistic to anticipate that the Chinese might reduce their trade ties with Iran simply in order to accommodate a growing relationship with Israel. As Kaplan notes, "China needs Iran's oil, and [Iran] is very nearby China," which makes it easier and less expensive to transport to China than oil from some other sources. That reality probably will not prevent China's pragmatic leadership from pursuing a close commercial relationship with Israel, which can supply China with something it can get nowhere else: Access to a range of technologies that could play a significant key role in boosting its productivity and prosperity."